By the time our babies can start some solid food, it would be a great milestone! Or at least it is to me, haha! For my elder daughter, I started her on puree around 5m2w, to see if she was okay with the swallowing, before moving on to finger food. For my younger daughter, she had been licking her lips when she saw us eating, since the time when she was about 4m old. I was really happy then, thinking, oh yay, I am finally having a non-picky eater. LOL, I just didn’t have any idea what is going to come. Well….. Until I realised she wasn’t picking up food! Okay okay, I tried for a few days and then I realised she was not eating well on her own. So I thought perhaps she was not ready. I postponed the feeding, and restarted when she was about 7m old. steamed apple slices with cinnamon. But still! She was not picking up food! This made me wait until she was nearly 8m old, but hey, she’s still not picking up food!!! LOL. 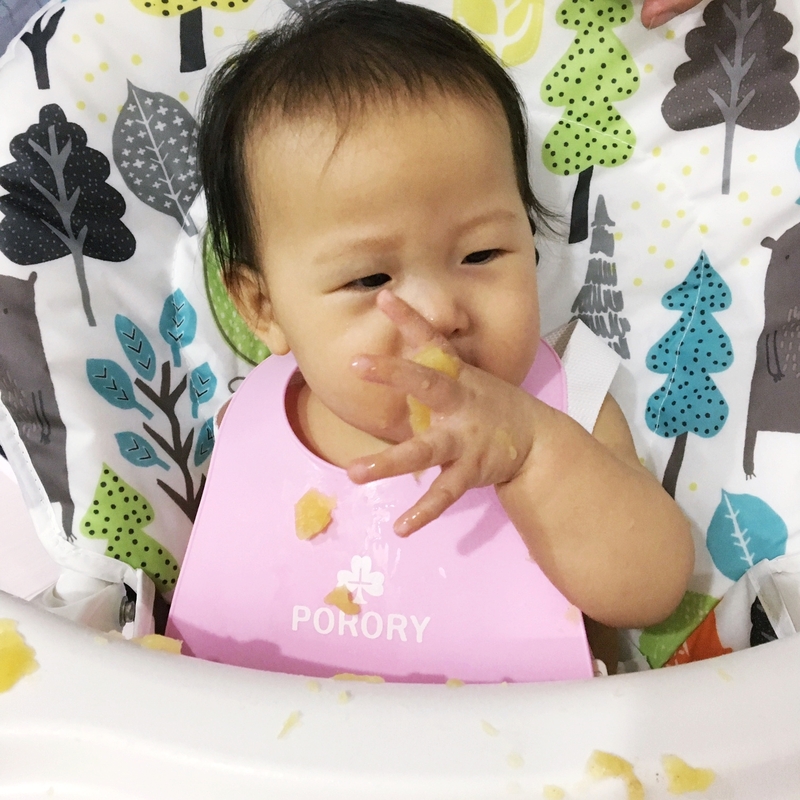 In the end I gave up and I started to give her puree so that she will slowly be getting used to the various types of tastes and flavors. Eating better being fed on the spoon. When & How To Start? Most experts recommend to start solids when the baby is around 6m old. The easiest way to start would be with pureed or well-mashed food. Though we are starting food around this time, do keep in mind that milk is still the baby’s main source of nutritions until 1 yo. And although I have a Beaba baby food maker, this time round, I was just using a fork to mash the soft, steamed food. Just ensure that you mash the food really well, and relatively smooth, so it’s free from potential choking hazard. The most commonly seen first foods would have got to be fruits or vegetables, such as cooked potato, carrot, pumpkin, apple, etc. Some fruits that do not require cooking, such as kiwi fruit, banana, or mango, would be handy if you are busy! Alternatively, if you are okay with baby cereal, you can also start with baby cereal. I have fed my younger daughter with brown rice cereal and multigrain cereal. Some mummies may prefer to intro solids 1 at a time; some mummies are ok to not do the 3 days test for allergies. For me, I did not do the 3 days test. I also felt okay in mixing different ingredients together for her meals. I just took note to be careful in eggs and dairy related ingredients, as these are considered to have a higher possibility of causing allergies. I only served dairy products (yogurt/cheese) around 8+m and eggs around 10m old. What Time of The Day To Feed? You can feed the solids before or after a milk feed. This time round, I would breastfeed my younger daughter first, before offering her the food. It’s usually around mid-morning or afternoon. It would be good if you can fix a time, so that a routine is in place. For me, it can be difficult to do that, so I try my best to stick to a time, otherwise I would just feed later in the day. Babies and children can take a while to get used to the various tastes and flavors, so don’t be surprised or discouraged if your baby rejects the food. I have read somewhere that it can take up to 15 times (OR MORE!) of offering the child the same food before he/she accepts the taste and texture! You can also take a look at this Pinterest board that I have created on Baby Weaning Food Charts. This board contains useful info (which I think is!) on weaning, as well as some simple recipes to embark on weaning food.